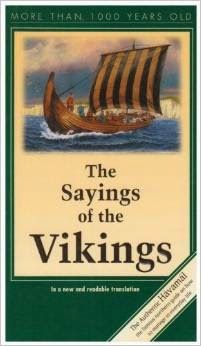 I have a copy of the Hávamál, which is a collection of 1,000 year-old poems translated as 'Sayings of the Vikings'. I found useful when I was writing my Norse stories Daughter of Fire and Ice and Sigrun's Secret as well as more recent younger stories. It wasn't that I used anything from it directly in my writing. It was more that it gave me a sense of how the lives of the ancient Norse people were different to ours and also in which ways they were similar. One of the ways their lives were very different was danger; especially danger of violent death. Thinking of Iceland, for example, as that is the Norse culture I'm most familiar with, there were clear laws and those who broke them could be sentenced to outlawry or fines. But there was no law enforcement, so if the guilty party failed to comply, his enemies would take matters into their own hands. Moreover, Viking tempers were quick and their sense of honour was strong, so feuds frequently arose. or crouch in a dark corner. Famously, assassins would climb up in the roof space of doorways and drop down on unwary victims, killing them before they knew what had happened. This gives such a flavour of the era. It is impossible to imagine in our lives today (in Europe anyway) having to inspect a doorway before walking in. There are also warnings on quarrelling at feasts as feuds can follow and on guarding your tongue and carrying weapons when you leave home. unless he tells too much. that they cannot keep silent. There are plenty of warnings, too, about alcohol: "drink is a dangerous friend," and "ale unveils [the] mind." There is no doubt that foolish behaviour after drinking is a thousand-year-old issue at least. Highly recommended for some insight into manners and etiquette of the times! What a great resource this must be! I'd never heard of it before. It's short but very sweet, Ann! Sweet as in useful rather than cute. I have never heard of this book, Marie-Louise. This is not at all my area but it sounds fascinating nonetheless, and reminds me a tad of Ireland. I was once at a dinner party at the Shelbourne Hotel where a row further down the long table ensued. One man rose to his feet and challenged another to a duel, throwing down a glove. I was astounded. Both men went outside and my publicist said she thought it was time for us to say 'Goodnight'! Anything passes for wit at home. As soon as you open your mouth. Of one who wins himself fame. And pay him measure for measure. The Words of Odin is full of useful advice! What fascinates me about the second example is how similar it is to the wisdom literature in the Bible (mostly in Proverbs). Sue, I love that- especially the bit about 'anything passes for wit at home'! The translation I have is very smooth and polished, but several reviewers have complained it's incomplete. Yours looks more faithful. Jane, I'm always fascinated by the overlap between the surviving Norse material and Christianity. I often wonder how much is attributable to the fact that the Norse tales weren't written down until after the 'conversion' to Christianity. Carol - wow, what an amazing story! The Havamal, like your publicist, advises getting up and leaving once arguments start at a feast as they can lead to violence and feuds. Good sense! Any similarity between the Bible and The Words of Odin may be due to Odin's words having been written down after conversion to Christianity. I think it's just as likely that both works simply gather together the kind of human wisdom that arises from having to rub along together. It's the same with morality - Do not murder, do not steal, do not bear false witness - these aren't 'christian.' They are the rules that arise in any society - especially in an age when it was vital that people cooperated to survive rather than bicker and feud.